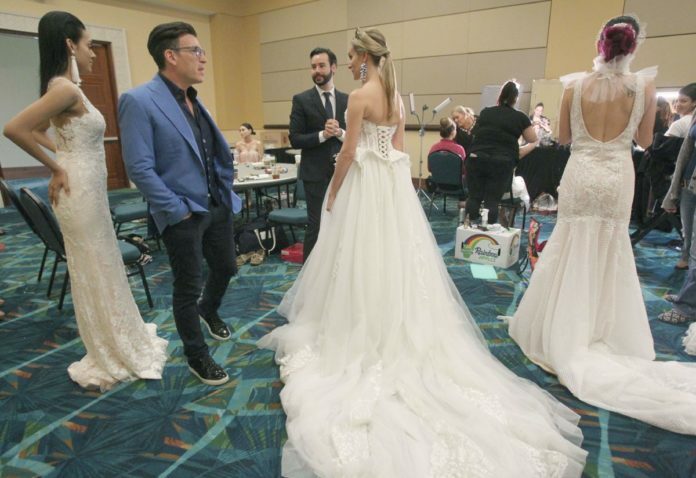 David Tutera, a celebrity wedding planner, visits backstage to see local wedding dress designer Manuel Tiscarneo's bridal collection on Friday, April 13, 2018, at the McAllen Convention Center. McALLEN — David Tutera learned quickly not to mess with Texas. Years ago, the celebrity wedding planner and television personality filmed two episodes — one in Dallas and one in Fort Worth — of WE tv’s “My Fair Wedding.” It was then he realized Texans are proud of where they are from. Tutera, however, warns that couples can go overboard with themes, adding that weddings can quickly become kitschy or more like birthday parties. If you’ve seen his show, he wasn’t afraid to express his feelings over a client’s choices. But often times he treaded lightly. Tutera, who is also an author and bridal fashion designer, was in McAllen for an appearance to help celebrate The Valley Wedding Pages’ 15th anniversary and for a bridal fashion show by local designer Manuel Tiscareno at the McAllen Convention Center, where he offered advice and guidance to guests as they prep for their big days. He stresses everyone should begin with a budget — and stick to it. When coordinating weddings, Tutera will let his clients know off the bat how big of a wedding they can afford. “No one should go in debt over a wedding,” he said in his interview with The Monitor. Just as important as the money, Tutera says, couples need to have fun. In his book, “The Big White Book of Weddings,” he writes that a task list should be treated as an exciting list of experiences. The wedding planner said he recognizes that a list of things to do is necessary when planning events. Often times, however, planning a wedding begins to feel like a job, he said. Tutera also warns that big weddings are not for everyone, adding he is often surprised by couples who don’t realize how much work it takes. Many times the stress breaks people, both financially and emotionally, he said.